"Like the Apple device, the Chromebook 13 sports a sixth generation Intel Core M processor and USB Type-C connectivity. It also has around 11 hours ofbattery life (11.5 claims HP). It even goes one better with RAM, being available with up to 16GB of on-board memory. The screen size is bigger too, at 13.3-inches. Its resolution if 3200 x 1800. There are Bang & Olufsen speakers and the chassis is just 12.9mm thick. The Chromebook weighs 1.29kg (the MacBook is just 0.92kg). 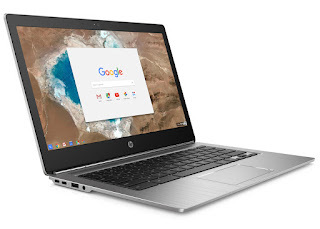 But price and screen size aside, the major difference between the new HPlaptop and Apple's is that the Chromebook 13 is exactly that, a Chromebook. Much cheaper it might be, but it is dependent on an internet connection and is far less supported with software and applications than Windows 10 and OS X equivalents."